Upington – Kgalagadi Depart from Upington to Twee Rivieren. In the famous Kgalagadi Park. En route we stop at the Khomani Bushmen. Then off to Twee Rivieren, the first camp inside KTP. Check in and enjoy a afternoon game drive until gates close. Game such as gemsbok, springbok, eland, giraffe, blue wildebeest and red hartebeest can be seen, as well as good sightings of lion, leopard and cheetah and spotted – and brown hyena are common residents. Kgalagadi is home to caracal, honey badger, black-backed jackal, bat-eared fox, cape fox, African wildcat, mongoose and meerkat. Kgalagadi is a bird watcher’s heaven with more than 300 species including 20 raptor species. The world’s heaviest flying bird, the Kori bustard and the secretary bird as well as Ostrich can be seen. 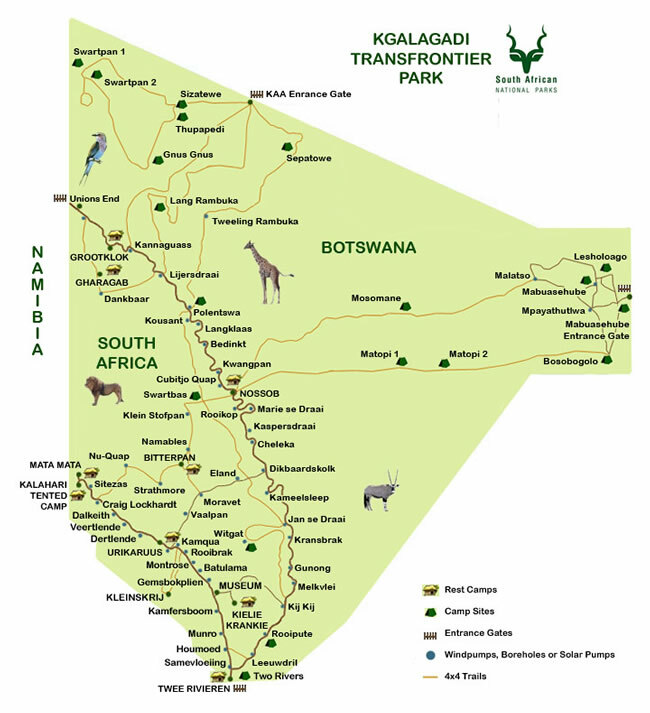 Kgalagadi Trans Frontier Park. We spend our time doing maximum game drives to arrive at Mata Mata or Kalahari tented camp late afternoon. Optional night drive. Kgalagadi – Gochas Early game drive in the Mata Mata area. Enter Namibia at Mata Mata Border Post. Proceed through the Namibian Kalahari along the dry Auob River to Auob Lodge 6km from Gochas. Auob Lodge is a game reserve with smaller animals specially adapted to the Kalahari. Optional night game drive. Gochas – Solitaire Early start of your tour to drive through central Namibia via Stampriet to Mariental. Visit the Hardap dam and nature reserve where black rhino, kudu, zebra, gemsbok, red hartebeest, springbok and a variety of birds, including waterfowl can be seen. Proceed via Maltahohe to Solitaire. Solitaire – Sossus Vlei – Solitaire Today we visit Sossusvlei with the highest sand dunes in the world. The main attraction to Namibia is but a small section of the Namib/Naukluft Park which covers an area of more than 49 000 km. The most incredible dunes are the highlight of today. Climbing 400 m above the dry Tsauchab River and 240 m above the surrounding sea of sand, these dunes make for stunning photography. Included in our visit is Sesriem Canyon in the dry Tsauchab River. Afternoon return to Solitaire. Solitaire – Cape Cross Early drive to Swakopmund. We enter the Namib Naukluft Park again and go through the dry Kuiseb River Valley, which is one of the most hostile areas in Namibia. From the Kuiseb Valley to Namibia’s main harbour, Walvis Bay, the road crosses the gravel plains of the Namib Desert and some gemsbok, springbok, ostrich and with some luck, Hartmanns mountain zebra can be spotted in this huge desert vistas. Visit Walvis Bay Lagoon where thousands of flamingos and water birds are feeding. We drive on to Swakopmund and along the Skeleton Coast through the National West coast Tourist Recreational area to the Cape Fur Seal colony at Cape Cross, and the Lichen Veld. LICHEN is neither plant, nor animal, consisting of algae and fungi living together in symbioses. We stop at the largest breeding colony of Cape fur seals in Namibia, numbering thousands. Jackals and brown hyenas can be seen hunting. Cape Cross – Twyfelfontein Today we drive North to the Skeleton area. We drive to Twyfel fontein a World Heritage Site. We visit the Bushmen Rock Paintings for a short hike – guided by a knowledgeable person. Twyfelfontein – Etosha National Park Early departure to Etosha National Park – entering the Park at Anderson gate in the south. Etosha covers an area of 22 370 square km. Etosha Pan is 120 km long and 70 km at its widest. Four of the big five species, elephant, black rhino, lion and leopard, are in the Park. Except for the rare and endemic black-faced impala and Damara dik-dik, giraffe, red hartebeest, gemsbok, eland, kudu, cheetah, hyena and large herds of wildebeest, springbok and zebra are common. We do an afternoon game drive, or you can just sit and relax at the wildlife activities at the waterhole at the Rest Camp. Optional night drive. Etosha We do several game drives and/or game watching at the Okaukeujo water hole. Early breakfast, then we game drive to Van Lindequist Gate near Namutoni, then we depart to Otjiwarongo driving through Outjo, visiting Lake Otjikoto. Early breakfast, then we depart to Windhoek. End of tour. Included: driver/guide, vehicle, fuel, accommodation, meals, cross-border fee. Excluded: daily conservation fees, optional night drives with rangers.